Faust, Alberta is a small village in western Canada. In Simone Spagnolo’s new one-man opera, it is also a state of mind. Setting an English libretto by Giordano Trischitta, it has very little to do with Marlowe, Goethe or Gounod, instead bringing to mind Schoenberg’s Erwartung or perhaps Maxwell Davies’ The Lighthouse. Last year at the inaugural Opera in the City festival, Spagnolo offered a wilfully hermetic setting of the symbolist play-within-a-play from Chekhov’s The Seagull. While leaving many questions unanswered, Faust, Alberta grippingly portrays a man haunted by his past and by himself. The heightened narrative can be cumbersome, but the text sharpens up in the ‘real time’ episodes and the words mesh convincingly with the music, notably imaginative in its use of an ensemble of violin, cello, clarinet and percussion. Moments of lyrical pathos are juxtaposed with blind, rhythmically-driven panic as the nameless protagonist imagines – or is he imagining? – that someone, or something is out to get him. The giant cogwheels that stud Cindy Lin’s set suggest the mechanism of a clock (or perhaps an infernal machine) and a figure totally shrouded in white seems to lie immobile on its upper level. 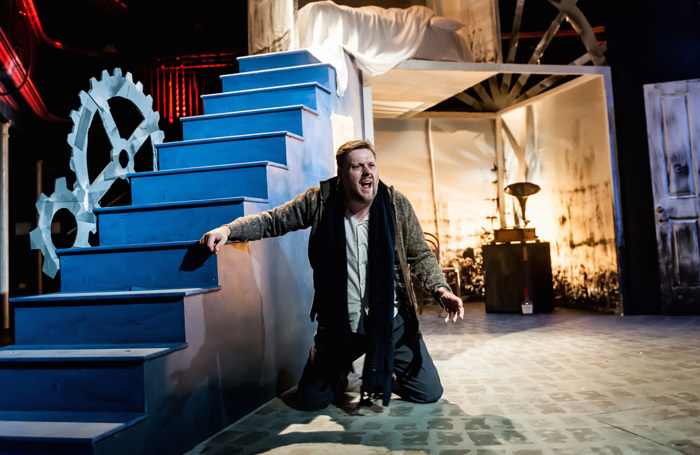 As directed by Pamela Schermann, baritone Benjamin Bevan is all the more convincing for being less an eye-popping maniac than a regular chap having the worst day of his life. By the end, the nameless character evokes sympathy. Bevan, meanwhile, arouses admiration for the clarity of his diction and his fearless handling of the score’s stream of vocal demands.